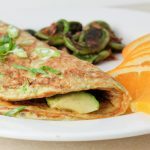 What makes the Avocado Lime Omelette so good? Everything about it! Match made in heaven. Work those into anything and I'm happy. Guacamole, tacos, or on their own: happy food dance baby! How in the world did I not know about this magical fruit until my 20s??? …I just started daydreaming about all the truly magic ingredients together: duck, avocado, lime, salmon sashimi, pineapple, prawns, bacon, cheese… How am I going to put these all together? Actually, an omelette would be an easy way to do that haha. I might need some alone time now. 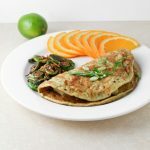 I've made this Avocado Lime Omelette 3 times this week. So I'm a fan. 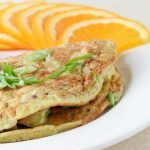 This is one of the simplest omelettes I've ever made since typically I like to really ram them full of vegetables. 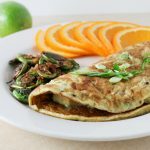 Enjoying an Avocado Lime Omelette doused in Frank's Red Hot, aged cheddar, and extra chili peppers is probably all I'll do for Cinco de Mayo this year, but I think it's a pretty good way to celebrate any day! In a non-stick pan, melt ghee over medium heat. Add diced onions and chilies and saute, seasoned with a pinch of salt, until golden. In a bowl, whisk eggs (I just use a fork), add a pinch of salt here too, as well as 1/4 avocado. Smash up the avocado a bit – think chunky guacamole. Cube the other 1/4 avocado, and put in another bowl. Squeeze some of the lime over this and sprinkle with salt. Add onions and chilies to the egg mixture and stir well. Melt a little more ghee in a pan, then pour in egg mixture, evenly coating the pan. Cook until lightly golden and the base is solid, then flip to cook other side. 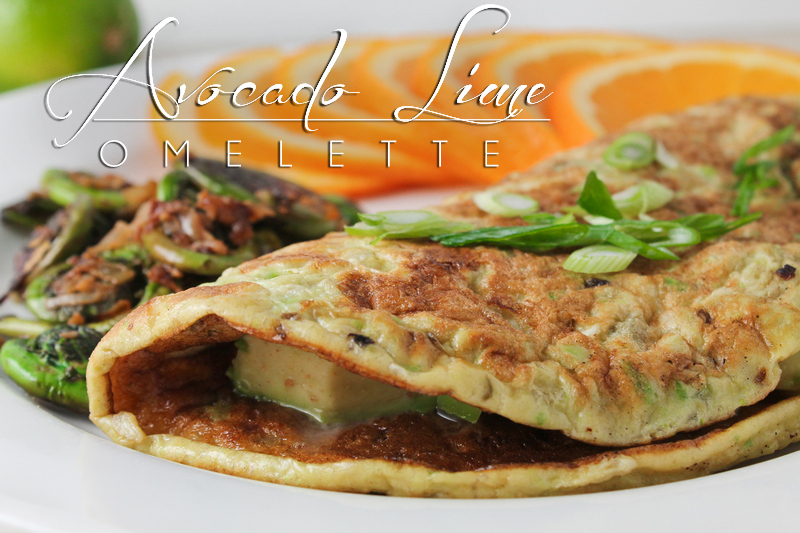 Slide omelette onto a plate, pour avocado cubes on half of the egg, folding the other half over top. Sprinkle with more lime juice and optional ingredients. I can testify to this being a good recipe. 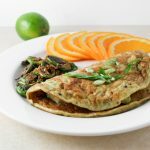 We ate our version of it about every second day while we holidayed in Mexico this year. I didn’t chunk the avocado, I just used the left over guacamole from the previous day’s Happy Hour. (Well, there often wasn’t any guac left over, but on the days that there was, this truely added to the omelette.) The fresh lime certainly adds to the flavour mix! 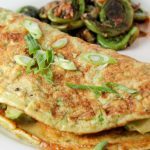 I was thinking that lime and chili powder that you brought Devi and I would be great on this omelette too. Dunno why I haven’t use that stuff more. We brought two bottles of it back for ourselves this year since we ran out early last year. Good stuff. You had me at bacon… but then I didn’t see it in the ingredients list. So I just went ahead and added it since bacon goes with everything. You know. Didn’t hurt it one bit. Adam, bacon wasn’t actually in this one, but you’re right sir: bacon would not hurt this at all! I was just listing some of my favorite ingredients when I mentioned the bacon, duck, etc. Thanks for verifying that bacon indeed does work well in this one! Oxygen DOES feel good in the lungs! I’m all about gratitudes so it’s all good Bro. I appreciate the comments. And now that we’ve connected over our love of bacon, I feel like you should look though our (actual) bacon recipes. I’m pretty sure you’d dig the bacon-wrapped onion rings btw. Oh boy… So much for getting anything done today. Yes, well, I’m sorry about that, but it’s obvious that you needed to see them. And you can do your meal planning/grocery list (i.e. bacon plus whatever is on sale) for the rest of the week. 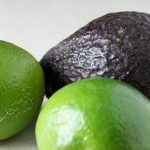 I often make omlettes and thought I had tried every flavour combination in existence – but never have I tried avocado and lime before. Thanks for the idea! I couldn’t find any on your site. 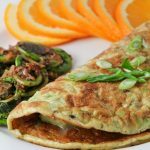 What are some of your favorite omelettes?